Where can I find the Saxo paint code / Saxo colour code label? Saxo Mk1 (up to June 1999) colour code: in the engine bay on the passenger side suspension strut top mount, you will find a stamped code. See Haynes Saxo Manual 3506 section REF-3 for an example picture. It will be five characters long. Saxo Mk2 colour codes can be found on drivers side door hinge pillar. You will find a self-adhesive identification label with the colour code on it. See below for an example. The fourth character is a symbol for the site of manufacture. R = base coat and clear. d ) Recommended tyre pressure of the spare wheel. 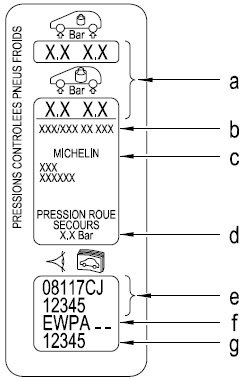 e) After Sales - Replacement Parts number; the ‘RPO’ number. f ) Paint code reference. g ) Factory serial number. The paint code consists of 4 letters (e.g. Polar White, code EWPA - -). Last edited by BobC; 31st July 2009 at 02:45.